With good advising, hard work, and focused energy, undergraduates majoring in psychology can have before them a future full of amazing possibilities. 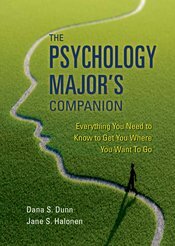 The objective of this book is to help students to declare the psychology major if it is in their best interests to do so, to learn strategies regarding how to produce optimal gains in the major experience, and to prepare for either graduate school or a psychology-related professional life. To create this guide, authors Dunn and Halonen drew extensively on experiences with their own students, as well as interactions with colleagues, especially those who are active in the Society for the Teaching of Psychology (Division 2 of the American Psychological Association).